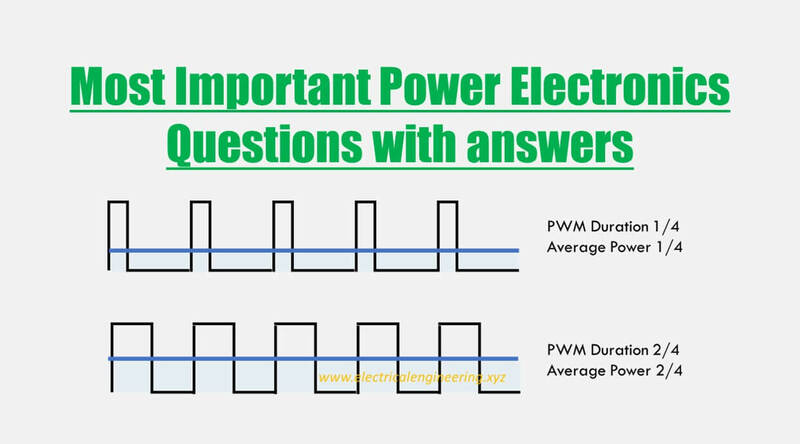 Today you’ll learn the basic top 8 questions on Power Electronics. PWM is a technique in which a digital signal is used to obtain a variable power. A digital signal has two states working: The ON and OFF. The actual power obtained from a PWM depends on the duration for which the signal is kept on. The figure below displays how PWM duration controls the average power obtained from a signal. Question 3: What are fast recovery diodes and what is their practical application? They belong to power diode class which have very low recovery time (usually under 5 µs). They are used in dc to dc and dc to ac conversion applications where speed plays a crucial role. Question 4: Explain the difference between latching and holding current with respect to SCR? The latching current is the minimum current which is required by SCR to enter the conduction state. Holding current is the minimum amount of current required by SCR to stay in a conduction state. Question 5: Explain and differentiate between frist and second quadrant converters? First quadrant converter: The load current flows into the load. In first quadrant converters, both load current and load voltages are positive. Second quadrant converter: The load current flows out of the load. In second quadrant converter the load voltage is positive, However, the load current is negative. Question 6: What is Buck-Boost regulator? A buck-boost regulator is a combination of electronic components that are used to obtain an output voltage that can either be higher or lower than the input voltage. Question 7: What is the natural commutation of the thyristor, and when is it used? Natural communication means the method of switching off a thyristor by using natural means. Whenever some ac input source is connected to a thyristor, after half cycle the current goes to natural zero and then reverse voltage is applied across the thyristor. As a result of reverse voltage, the thyristor is turned off. This phenomenon of switching off is termed as natural commutation. Question 8: Explain single phase dual converter and its practical application? A single phase dual converter is the combination of two full converters and it is used in high power variable speed drive applications.